Croze – The tool used to cut the groove in the bottom of the barrel or bucket. The groove is also call the croze, this leads to a lot of confusion since the tool and the resulted cut have the same name. Backing a Stave – A process to round the outside surface of the stave. A draw knife is usually used when this is done manually. A molding machine can be fitted with a hollow cutter to automate this step. Bilge or Pitch – Widest part of a barrel. The center when measured end to end. Circle Cutting Jig – A special jig used to cut the heads in a near perfect circle. The jig is simple to make. This jig is designed to cut up to a 24 inch head. 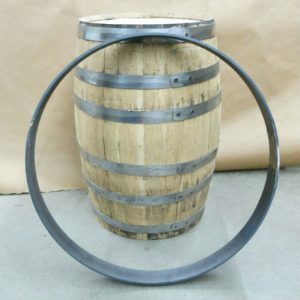 Crozing Ring – A ring designed to fit around the end of the barrel and only used during the crozing operation. The outside surface of the ring must be smooth to allow skate board wheels to ride on it. The outside of the ring guides the cutting of the croze. In addition, four adjustment screws are used to center the barrel in the ring. The ring should project about ¼ inch beyond the end of the barrel. The screws are positioned to avoid the skate board wheels. Go-No Go Gauge – A gauge with two settings. One setting is at the extreme small end of a range. The second setting is at the extreme large end of the range. A work piece should fit the go (large) section and not the no-go (small) section. Head Molding Router Bit – A special router bit that cuts a serpentine profile on the edge of the heading material. This profile provides a huge surface area and a difficult path for liquid to follow providing a really great sealing joint on the head. This profile is also interesting in that only one cutter is required for both surfaces. A traditional tongue and grove joint requires two different cutters. Hollowing a Stave – A process to round the inside surface of the stave. A hollowing knife is usually used when this is done manually. A molding machine can be fitted with a convex cutter to automate this step. Jig – A device used in wood and metal working to hold a part during a machining operation. During the coopering class we use a jig to hold the stave at a fixed angle to template route the stave. Jointing a Stave – A process to place the proper angle on the edge of a stave. The angle can be calculated by the following equation. Molding Machine – A powered machine that has shaped cutting knifes that cut a complex profile in the face of lumber. These machines are commonly used to cut molding for houses. In this class we have made custom cutters that cut the interior and exterior of the barrel staves. Setting the Barrel or Setting the Staves – A process to heat the barrel after it has been fired to remove the spring from the staves. This is required to place the head in the barrel. If the barrel is not set, it will spring open when the head is inserted. The barrel is set by building a hot fire in a crescent and placing the barrel over the fire with a cover on it. About 10 minutes on the fire is required to set the barrel. 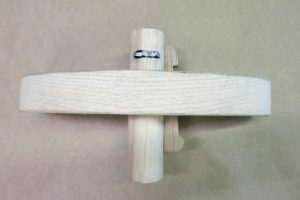 Setting-Up Jig – A jig used to hold the stave in order to place the head ring and quarter ring in place during set-up. The jig usually has a base and four up-right arms. The head hoop is placed on the base and the quarter hoop is positioned on a stop on the up-right arms. After staves are loaded into the jig the staves are held in a vertical position wedged against the head hoop, the base and the quarter hoop. Story Board or Story Pole – A board with layout markings containing critical measurements or dimensions. In this class we use the story board to set the dividers when we are making heads. If we measure the croze with a set of dividers and then transfer the measurement to a board, we can store multiple head sizes using only one set of dividers. We also use a story pole to consistently position hoops.